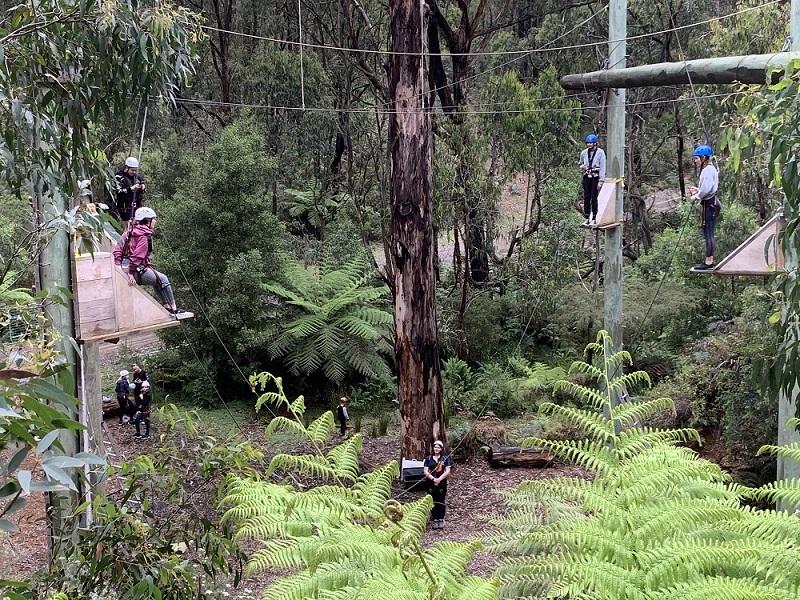 An action-packed day out for families, Kinglake Forest adventures offer outdoor climbing and treetop courses for kids, Tug of war centre fall, 3 mountain bike tracks, and a wallaby discovery centre. 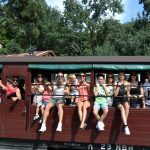 Take a day trip or a weekend getaway into the forest and close to nature at Kinglake, just an hour north of Melbourne. 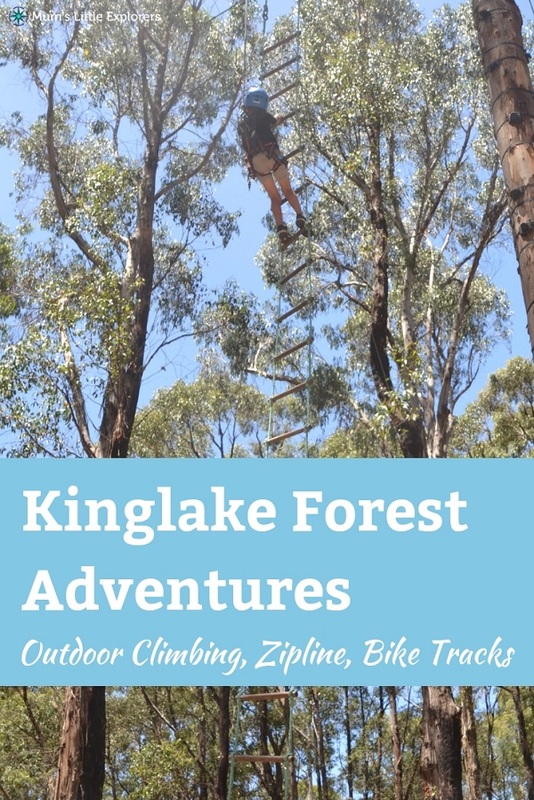 If you are looking for somewhere to rock climb with kids in the great outdoors, Kinglake is a great day trip from Melbourne. 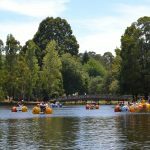 Destroyed by the Black Saturday fires in 2009 this forest camp at Kinglake has been rebuilt into an outdoor forest adventure park for thrill seekers. 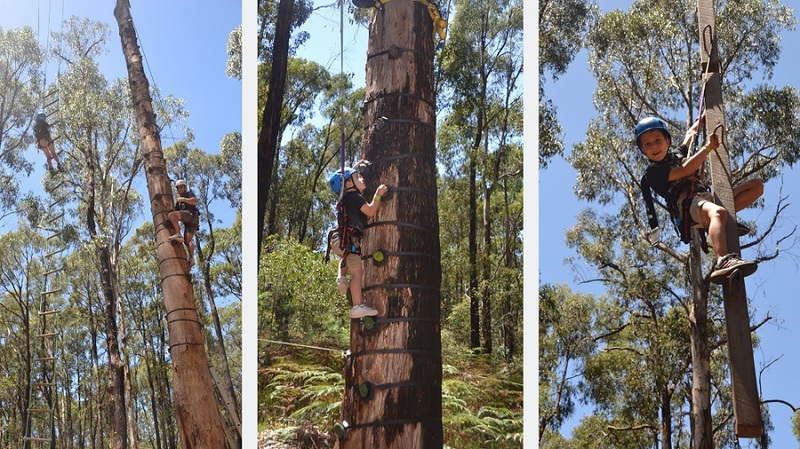 Kinglake Forest Adventures offer a range of team building activities for families that get everyone involved. On arrival, get harnessed up by one of the safety instructors, collect your wristbands according to the activities you are participating in, and head with your group into the forest! With no course to follow, you can decide which activity you would like to do when, so if you want to skip one you can. There are safety instructors all around to clip you on and off all activities, and there is always someone around for assistance. Scale the treetops with the 6 different tree climbs ranging from 4 metres to 16 metres from the ground. Kids as young as 4 years old can clip and climb to give each one a try. If they can’t make it all the way to the top, no problem, just jump off and your harness will safely drop you do the ground. For those under 4 years old there is the Littlies Forest Adventure so nobody misses out on the fun! 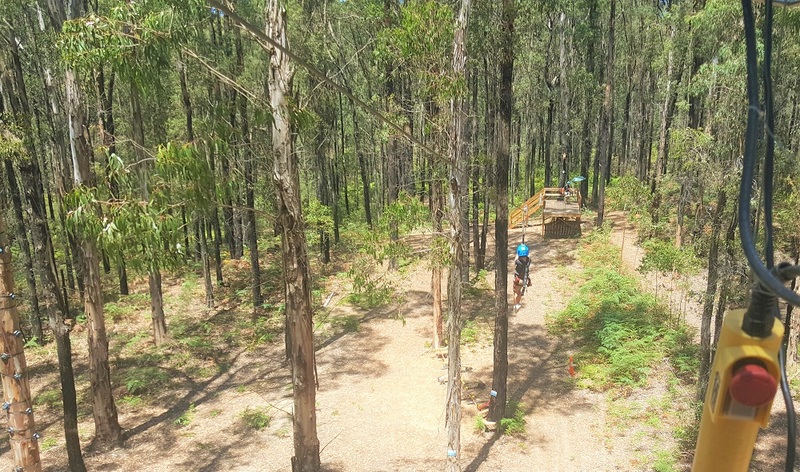 Soar through the forest on the Kinglake Forest Adventure Zip Line. 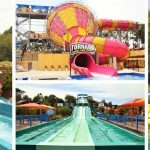 Kids and parents can both enjoy this adrenaline pumping ride and line up for more! Our little monkeys went over and over again! These free fall jumps are great for any age… If you dare to jump off plunging off the 9 metre platform! This is the ultimate adrenaline rush that will get your heart pumping! Count to 10, close your eyes, don’t look down – whatever works for you to get you to take the leap! Once you do, you will be safely lowered to the ground, and probably want to go again… or not! By far the ultimate jaw dropping adventure activity for kids and adults! Four participants must climb to the top of the 8 metre platform, and stand on the edge attached to their harness and a “tug of war” rope. When it is time to play you go to war pulling and tugging the rope until there is the last one standing. He or she claims the title of the ultimate forest adventurer! Just like the free fall jumps, it is the ultimate adrenaline rush. But this is war! Definitely not for the faint hearted but so much fun. Note that this activity isn’t for real little ones as participants need to be able to climb to the top and pull themselves up. Our 4yo couldn’t reach but our 6yr old was ok. 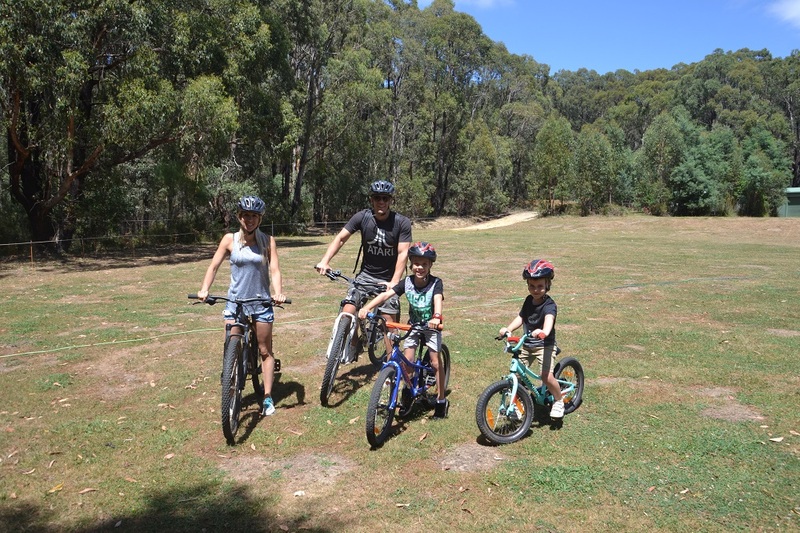 Hire bikes or bring your own to explore the Kinglake forest with three forest tracks. Suitable for all age groups these beginner and Intermediate tracks are perfect for group or family rides with bikes of all sizes for kids and adults. Want to ride but you have a little one who can’t quite keep up? King Lake Forest adventures have the shotgun riding seats meaning nobody gets left behind! These bikes allow kids from 2-5 year old (22kg) to cruise along with you. Every weekend, school holiday and public holiday (except XMAS day and July 16th-August 30th 2018). Open at 10:00AM for walking, discovery centre, outdoor rec arena then the first bike and treetops sessions at 11:00AM. $45.00 – Quality Specialized bikes for all ages and abilities. There is a café serving freshly baked pastries. You can also purchase coffee and cold drinks. If you prefer, you can bring a picnic rug and lunch along with you. *Details correct at time published, please check the website for details. King Lake Forest Adventures offer birthday party options for those celebrating their special day! You can find information on their party packages on their website. 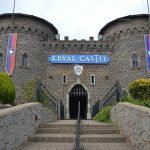 If you are a looking to head out of Melbourne for the day, King Lake Forest Adventures is the perfect place for your little thrill seekers. Pack your day with Clip n Climb, Ziplines, Free fall jumps, tug of war in the treetops, and finish off with a bike ride through the forest! Looking for indoor rock climbing or other treetop adventures? 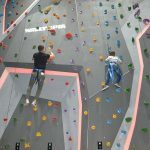 Check out: Climbing for Kids in Melbourne with various options!